Like so many, at the top of that list was Italy, three glorious weeks to explore all those magical places you see in movies, travel magazines, and history books — Rome, Venice, Florence, Tuscany. But perhaps most memorable were the four glorious days we spent in the small seaside villages of Cinque Terre on the Italian Riviera. 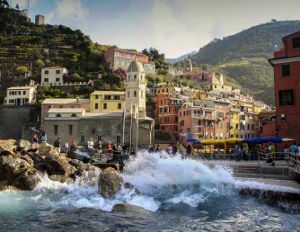 Cinque Terre is comprised of five small villages perched precariously along the rugged cliffs overlooking the Mediterranean Sea. The area is famous for its colorful houses of yellow, orange, pink, and red stacked like building blocks on the cliffs above the sea. Stories say they were painted these brilliant colors so the fishermen could recognize their homes from the sea. 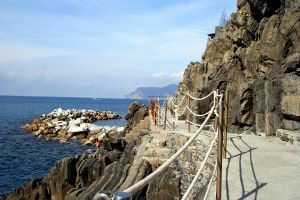 The region is accessible by popular walking paths connecting the five villages, Monterosso, Vernazza, Corniglia, Manarola, and Riomaggiore. Unfortunately, a recent slide had closed much of the pathways, so we elected to explore the villages by way of the local train, boarding at Monterosso and setting out for Riomaggiore, the last of the villages. The train wound along from village to village, dipping in and out of mountain tunnels. We wandered hilly, narrow streets with charming cafes, shops, and bars. We traipsed through historic ruins and seaside squares. We stopped for authentic Italian gelato freshly made each morning. Having visited the villages by train, the next day we set out to experience them by sea, hopping on a ferry in Monterosso and setting sail for Vernazza and Riomaggiore. Approaching the villages by sea, with the waves crashing on the rocky shore and the houses rising in splashes of color up the cliffs, was literally breathtaking. 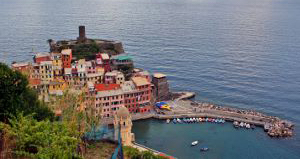 Most people claim Vernazza to be their favorite and we were no exception. The small village dates back to 1338 and appears to be built within the walls of an ancient castle and fortification, plainly visible from the sea. Hiking high up above the town of Vernazza and its ancient castle, we could look over the colored houses and rooftops with the sparkling blue waters of the Mediterranean as far as the eye could see. Throughout the villages small, cozy restaurants spill into the streets, basking in the autumn warmth, serving fresh local produce and crisp local wines. The area is industrious, carving terraces up the mountainsides to grow grapes and olives. Local wineries offer tastings, a casual experience in local bars where the proprietors proudly share their prized vintages. Cinque Terre is a gem, a step back to a time when the simpler things were valued and people shared with pride the results of their work. It is a place with no corporate presence, no cars in the streets or fast-food restaurants. A place where you can breathe in deeply the fresh, clean air, hike high above the sea, or sip a glass of wine at a friendly street cafe. Romantic, relaxing, and stunningly beautiful. I know it is a place I will return to again.